This is a sponsored post. I received compensation and free product in exchange for my work, but all opinions are 100% my own. 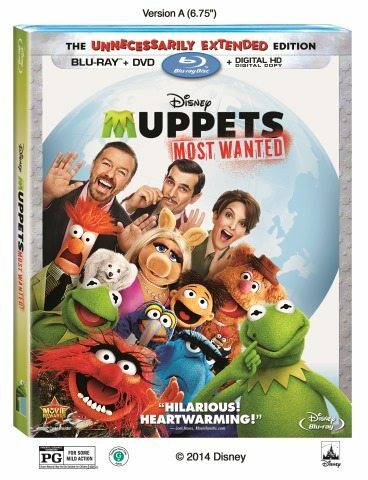 Did you catch Muppets Most Wanted while it was in theaters? Somehow we missed that one, so I was very excited to hear that the movie was soon to be released on Blu-Ray. I have been a Muppets fan my whole life, and I am thrilled to be able to enjoy new Muppets movies with my kids. I don’t think you can ever outgrow enjoying the Muppets really. 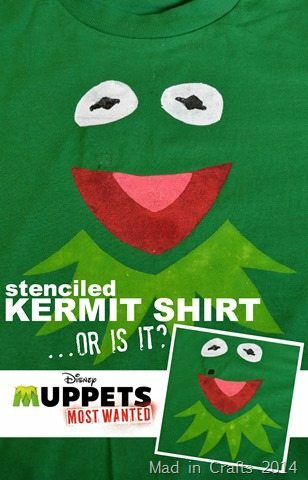 As a part of this Muppets Most Wanted promotion, I wanted to create a fun and easy t-shirt that played on one of the major themes of the movie, the mistaken identity of our hero and villain! The movie is packed with dozens of guest cameos and new songs, including the hilarious “We’re Doing a Sequel” right off the bat. My husband and I were laughing along with the classic Muppets humor, and the kids were loving it too! The Blu-Ray combo has extended scenes not seen in theaters and plenty of bonus features, including a blooper reel. Personally, I am planning on watching the “Statler and Waldorf Cut” ASAP. 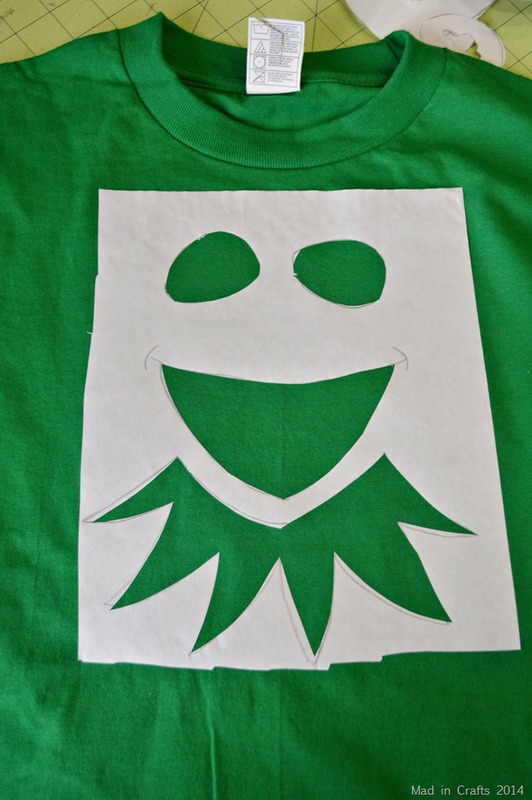 I initially planned on using my Silhouette to cut the freezer paper stencil, but I could not figure out how to make the design work properly. I cut my losses and reverted to making the stencil the old-fashioned way. 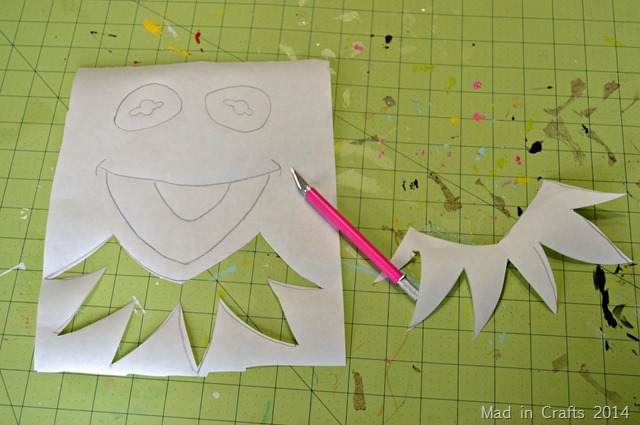 I sketched out Kermit’s eyes mouth and neck, using an online image for reference, and then cut out my freezer paper stencil with a craft knife. I ironed the stencil on with my iron on medium heat, making sure that all the edges were totally adhered to the t-shirt. This shirt design requires two layers of paint. I painted the neck and the large parts of the eyes and mouth first. At this point, the t-shirt was terrifying. 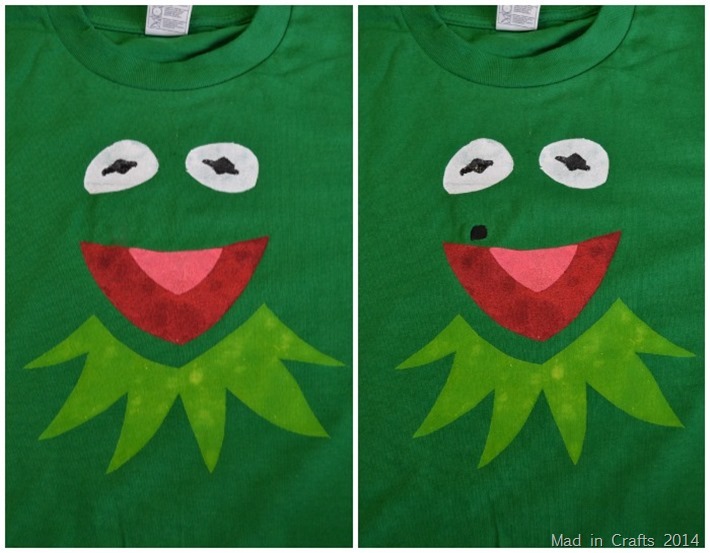 Appearances can be deceiving, and what looks like an innocent Kermit face is actually Constantine in disguise! 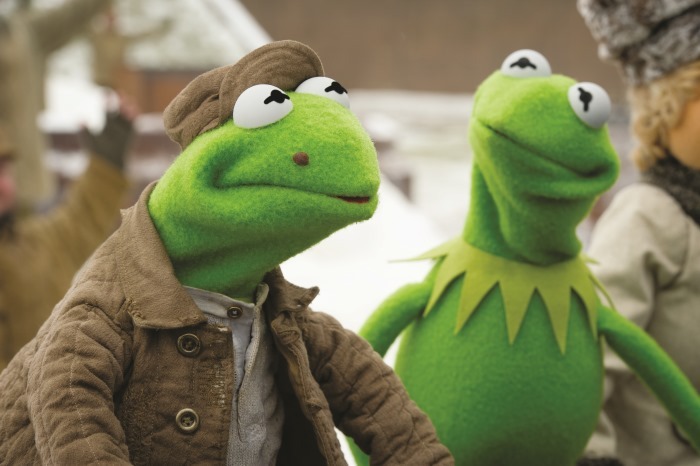 Constantine is the #1 most dangerous criminal in the world, but he bears a striking resemblance to Kermit. As you would expect from a Muppets movie, action and hilarity ensue. 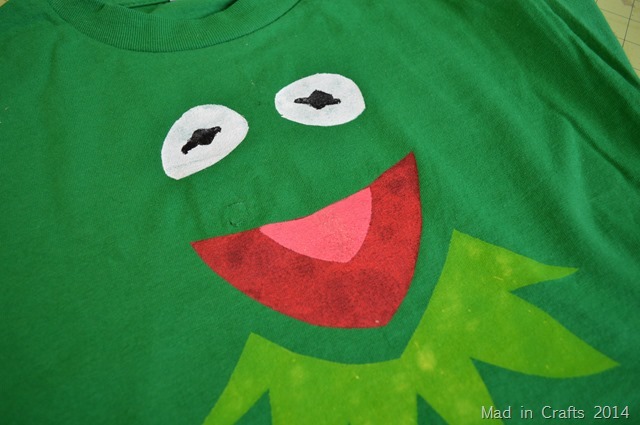 To turn my Kermit shirt into a Constantine shirt, I used fabric glue to attach a small square of black felt to the inside of the front of the shirt, where Constantine’s mole is located. Then I cut a C shaped slit in the t-shirt over the felt. I can fold the circle of green t-shirt under itself to reveal Constantine’s distinguishing mole. 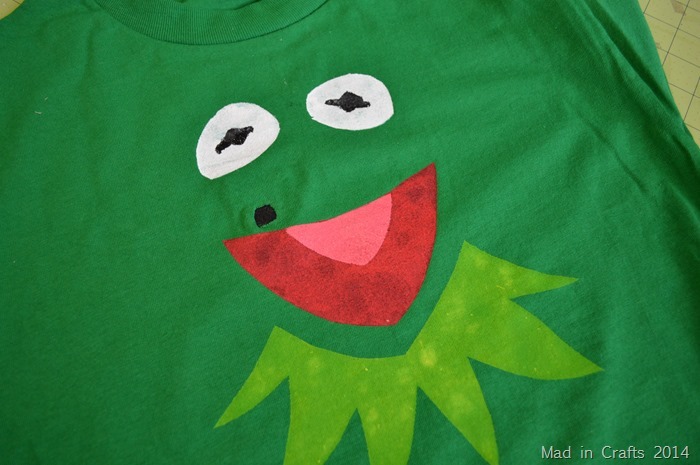 If I would rather have a Kermit shirt again, I unfold the flap of fabric and smooth it out over the felt. Just like that, Kermit is back again! It’s a silly little detail, but silly projects are the way to go when you are being inspired by such a silly and entertaining movie. Muppets Most Wanted is available on Blu-ray Combo Pack and Digital HD on August 12th at Disney.com. Mark your calendars to get your hands on one as soon as they go on sale! If you are a Muppets nut like I am, you can keep up with any news by following the Muppets on Facebook, Twitter, and Pinterest. I love Kermit and love this shirt! Kermit was my first celebrity crush, even before David Bowie as Jared the Goblin King, which is really saying something. 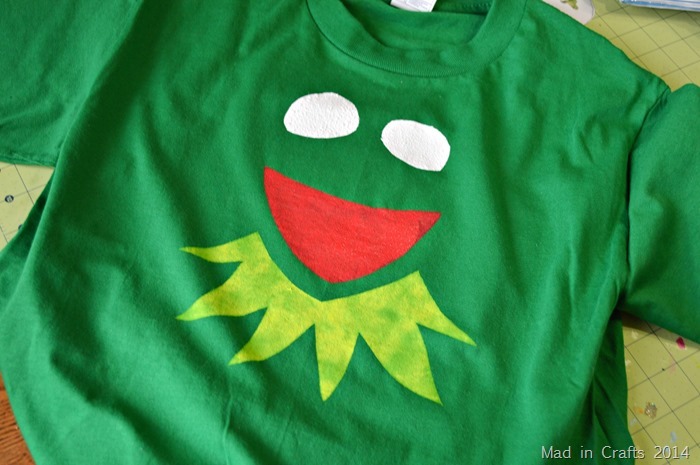 I’d wear an awesome Kermit shirt to my own funeral. Kermmyyyy!!!! Such a cute idea! I just love it! 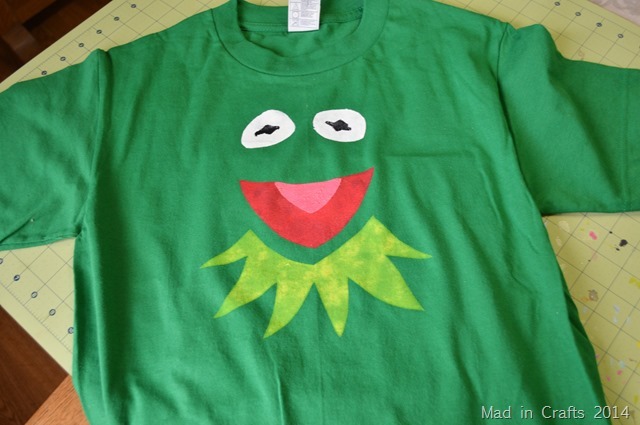 It would be fun to do Kermit on the front of the shirt, then do one of those upside-down inside the shirt jobbies where you flip it over your head to become Constantine. Love the way you designed the stencil! That\’s a great idea, Heather!